Ahead of the Budget Session, President Ram Nath Kovind on Thursday addressed the Joint Sitting of both Houses of Parliament and said that the country was going through a phase of "uncertainty" before the 2014 Lok Sabha polls, hence the BJP-led central government took up the initiative to form a "New India." "The country was going through a phase of uncertainty before the (2014 Lok Sabha) election. After the election, my government took up the initiative to form a 'New India'," President Kovind said. 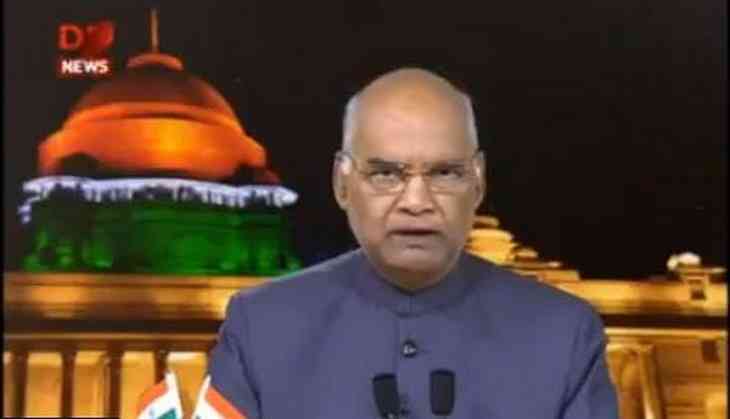 Lauding the Prime Minister Narendra Modi-led government over its various initiatives, President Kovind said: "We know that expenses on health makes a poor even poorer. My government understood this and started Ayushman Bharat Yojana. In the last four months, more than 10 lakh poor people availed health benefits in hospitals under this scheme. Healthcare is my government's topmost priority. I am happy to inform you that the benefits of government's schemes are reaching poorest of the poor." He added that the Citizenship Amendment Bill will "make it easier to provide Indian citizenship to those who had to take refuge in India after facing oppression somewhere else. They were not at fault, they were victims of situations like that." The President went on to add that under the Pradhan Mantri Jan Dhan Yojana, "34 crore people have opened bank accounts and almost every family in the country is connected to the banking system." "According to an international agency, 55 per cent of the total bank accounts opened between 2014-2017 were opened in India itself," he said.